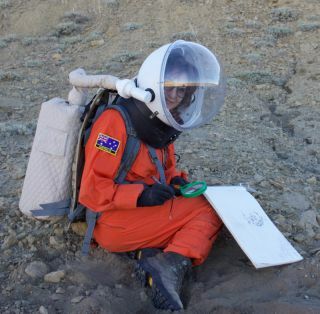 Mars 160 crewmember Annalea Beattie on a simulated Marswalk. Last week I sent a happy photo home of our crew in the hab. Well, Mo, no, it's not really like that here. But in space, on Mars, where small communities are locked inside together with little visual, tactile and auditory input from the physical world, always in constant threat to life from the harsh environment, devoid of fresh air and natural light and in long, monotonous periods of confined microgravity, a bit like these very long sentences I am writing to you, yep, I can see why you might think that things could get a little crazy. There's a lot we don't understand about how people will live together on Mars. When we talk about habitability and long-duration space travel, it's about the relationships between the crew and their environment. No one doubts that the vast scales of space, prolonged stress and sensory and social deprivation can result in maladaptive behaviors and disorders. As we travel far from Earth in our starships to Mars, our lives will need to be regimented, and there will be little room for spontaneity. Every breakdown or mistake can affect the whole crew and put the mission at risk, Within the spaceflight environment, it's difficult to understand the differences between sensory deprivation, social isolation, monotony and confinement. This week I've been wondering why. Perhaps part of the reason is that while we recognize each other's needs, we are also very conscious of the needs of the habitat as our shared home. We know that to care for each other, we need to look at where we live and its limited resources. For instance, water is especially precious. Being able to control one's own environment decreases stress. There's one member of our team who keeps it all ticking over for us — our unshakable, funny and debonair Crew Engineer, Claude-Michel Laroche. Mars 160 crewmember Claude-Michel Laroche. Claude-Michel is a Canadian, born in Montreal. Part of MDRS Crew 143, he has university degrees in both Physics and Physics Engineering. Claude-Michel has always had an interest in space exploration, but after attending the International Space University in Florida in 2012, he decided to become more involved in the space industry. He became a Mars One candidate (Round Two). He then applied to the Mars Society for Crew 365, which eventually led him here, to Mars 160. Now he's keen to work as an engineer or a scientist for the Canadian Space Agency. So much about life anywhere is routine. Claude-Michel is our dependable, behind-the-scenes person around the hab. This mean he works tirelessly all day on large and small tasks, anything to make the hab more livable, humanizing the interior of our spacecraft by keeping it balanced and working, ensuring we live in comfort. Claude-Michel is the one who can adjust a spacesuit to your back so that it makes you feel as if it's no weight at all. And he can whip up a birthday cake out of chocolate pudding and pancakes in a flash. But his main role here as part of our team is to keep everything in the hab functioning. Claude-Michel says, "It is very important to understand all the systems in the hab to allow us to play with them and repair them. Systems here need to stay within allowable tolerance, and if one breaks or needs modification, we need to be able to perform the task or design the task to allow the best performance we can. This goes for everything, like the air and the water heater, the spacesuits backpack, the electricity, the computers, the water system and everything else that is required to work and give us the best living time for the whole duration of the mission. As routine tasks go, for an engineer, most of the time it is about extinguishing the fire." Yusuke Murakami and Claude-Michel Laroche. Parallel to his engineering work, Claude-Michel is the key support and principal research collaborator for Heather Hava's Bioregenrative Life Support Systems Project(BLiSS), a mix of human factors studies, life support system and agriculture thatenhances habitability and diet by growing fresh foods. In fact, we are all research collaborators with Heather. The SmartPots are a hydroponic system that monitors the health of the plants and lets us know whenever they need attention. Basically, each crewmember has his or her own SmartPot that contains the young plants, a device ("embrace") that is a wearable monitor placed on the wrist and a beacon. Plants are placed in different locations around the hab; some are in the rooms, but most are in the zone where crewmembers spend time. Beacons monitor the physiological data and the movement of the crew near the plants as well as time spent. I have tomatoes, bunching onions and bell peppers. Though the bell peppers are not looking too great, Claude-Michel is pollinating the tomato flowers, and I'm hoping for tomatoes. Heather's research is funded by a NASA Space Technology Research Fellowship. Our crew, with Heather Hava in the middle. We have quite a garden growing here now. In terms of the computational systems for the initial phases of the SmartPot (SPot) project, Claude-Michel began by configuring all the computers that allow the SPot sensors to stream their readings onto a specific website in order for the data to be compiled. Everything had to be calibrated to allow as much of a precise reading as possible. Now, on a daily basis, with the help of cross-trained crewmember Yusuke Murakami, Claude-Michel continues to make sure all the readings for the strawberries, spinach, bell peppers, dark purple Mizuna, Tokyo bekana, wonder wok (which is a salad mix), micro-greens rainbow salad mix, Romanian lettuce, dill, coriander, rosemary, basil, spearmint, borage, the tomatoes and the bunching onions are all within specific limits that change daily from SPot to SPot. This means the pH levels of the plants have to be verified as well as the electro-conductivity levels, temperature and dissolved oxygen levels. Claude-Michel trains and monitors the crew who perform tasks to make sure the plants are growing in the best possible conditions, growing as fast as possible and bearing fruit or edible leaves or roots within mission time frame. So that we can get everything working together in harmony, all our plant tasks are completed by following the protocols provided by the Earth science team who created and engineered the systems. I won't be leaving our hab until I have tomato salad with bunching onions. Me, taking my five daily photos of the tomatoes and bunching onions. I asked Claude-Michel if he misses the outside world, in particular the smells and the sounds of the physical world, and he says no. He claims he has a very strong sense of adaptation and is hardly affected by sensory deprivation (though he did remember the memory of lemons from the citrus wipes). When I think about the vastness and the potential bleakness of deep space, for some funny reason, an excerpt comes to my mind from a poem called "Darkness." Written in the early nineteenth century by Scottish poet Lord George Gordon Byron, this excerpt is not even written about space but about darkness, in the "pall of a past world." Great poem. If only I could remember the rest of it. I can see the dark sky and a chill breeze sweeps in and ruffles my hair. If it's not already there, when we travel to Mars, we will bring life.